Relax & Enjoy the Journey. Travellers like you are faced with so many options when you want to see the world. It can be pretty overwhelming to settle on one particular adventure when there’s so much to choose from. You’re already thinking about going guided, which is a really smart first step! Here’s how going guided will get you more for your money. Save yourself time and money when you purchase a Collette tour. If you have ever planned a getaway, you know how overwhelming it can be to put together your own itinerary and plan logistics. Which airline should you choose? Where should you stay? How will you get around once you’re there? Where are all the must-sees? Travelling with Collette is a perfect way to not only eliminate the hassle of planning a trip, but it’s also a great way to take advantage of the expertise, industry relationships and strong buying power that we have built over the past 100 years. With all the details taken care of, all you need to do is pack your bags and enjoy the savings. We understand that you want to get the most for your money, so we make sure that’s exactly what happens. When you choose one of our guided tours, you get a carefully crafted holiday in which we take the time to plan all the details ranging from sightseeing to enriching cultural experiences to even taking you to and from the airport in a private luxury sedan. All of this is done with a focus on getting the best prices and passing the savings on to you. Our experience and industry relationships help us provide you with the best journey for the best value. Wisdom is acquired through experience and Collette has 100 years of it, being founded in 1918! 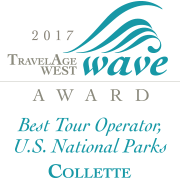 The United States Tour Operators Association (USTOA) acknowledged Collette as one of their original tour providers, making us the oldest guided travel company in North America. We’ve learned a lot and made a lot of friends over the years and you get to benefit from it all. What do you get when you put Collette’s Tour Designers and Tour Managers together? A life-changing experience that’s worth every penny. Behold the unparalleled sites you’ve dreamed about visiting like the Notre Dame Cathedral in Paris, the Sydney Opera House in Australia, the Great Wall of China in Beijing, and so many other iconic destinations. Our expert Tour Designers don’t just develop a tour; they create an avenue where travellers can absorb the lives and surroundings of other cultures. Tour Managers provide travellers with exceptional knowledge, warmth, adventure and comfort as you become immersed in a new destination, making sure you don’t miss a single thing.